Happy New Year! 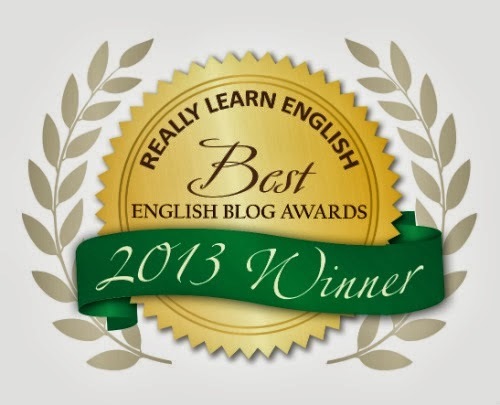 My first, long over due, blog post of 2013. Based on a post first written in July 2010, it is one of a sequence of blog posts I wrote when I first started blogging. It talks about picturebook peritext, still vastly misunderstood in ELT contexts, so I am creating a newer version, adapted, but with the basic information I shared back in 2010. Over the last two years I've written about over 90 picturebooks, and I almost always talk about "those other bits" - it seems odd to be reading (re-writing) this post, knowing now that I would find it difficult to talk or write about a picturebook without mentioning the peritext. 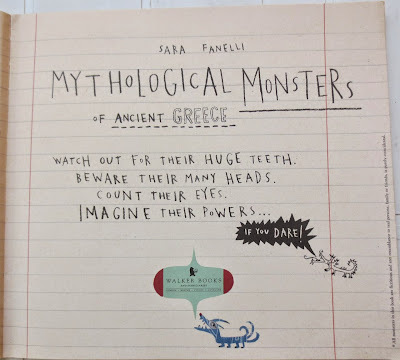 In my original post I discussed a recently discovered picturebook Mythological Monsters, by Sara Fanelli. In this new post I look more closely at this picturebook, which, sadly, is now only available through second-hand books stores. Children’s publishing uses illustrators, authors, editors and book designers to ensure all the different parts of a book - front and back covers, dust jackets, endpapers, half-title and title pages, copyright and dedication pages - are brought together with the pictures and the words to produce a unified end product, the picture book. An object in itself, one we should be taking more seriously in our ELT classes. The covers of a picturebook help introduce us to the main characters and setting. They set the tone of the story, using colour and shape, and even the way the title is written is important. The title of this picturebook is being eaten by Argus! When sharing a picturebook with our students, we can also point out that someone was responsible for making the picture book: there may be two names or just one. Small children often show amazement when they understand that a picture is made by one person, someone who is clever enough to illustrate and write a book. I recently read an article by Martin Salisbury, who called the person who writes and illustrates 'an authorstrator'. Some of these authorstrators design their own texts, creating their own hand-written fonts. Sarah Fanelli is an excellent example, the picturebook Mythological Monsters contains her own freehand font as well as some wonderful examples of collage illustration. I've chosen this book to talk about 'the other bits' of a picturebook. Front cover - that illustration of Argus, the monster with 100 eyes (and some of them need glasses!) is a great front cover, it's going to be a scary book! Can you make out the arrows in white moving from left to right in the background? They are beckoning us to open the book. Back cover - But if we first turn over to the back cover we will see colourful ink drawn outlines of all the monsters set against a background of fallen buildings. Do we recognise the monsters? We can also read the reviews "A visual, eye-popping tour of the scariest Greek horrors." (The Times) - reviews can be shared with older students when first encountering a picturebook. They can also be encouraged to write their own reviews which can be shared in a school magazine or blog or on child-made bookmarks. 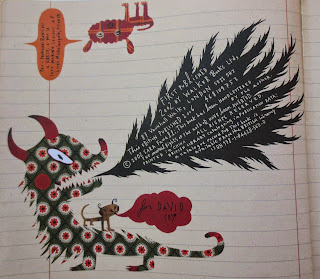 for the reader to write the names of the monsters. Do we know these monsters? Do we write the names before we read or after? Endpapers in picturebooks come in various forms, sometimes illustrated, sometimes not. Even if an endpaper is blank, it could be so for a reason, so don't dismiss it. 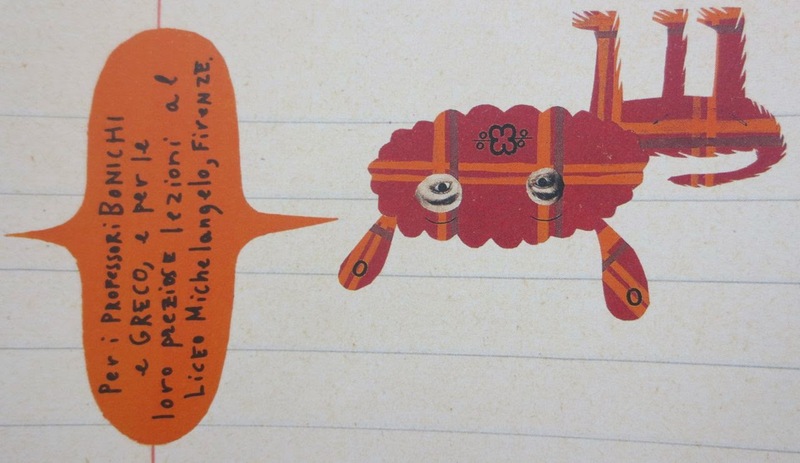 Illustrated endpapers almost always contain narrative clues. Sara Fanelli's front endpapers are giving us clues to what we will find in the book, and challenging us before we've even started, to see if we know. The back end papers are different. Fanelli has created a kind of quiz, and her ink drawings appear alongside questions, to test how observant we have been, encouraging us to go back and see what we may have missed, or confirm what we already knew. The back left side endpaper gives us further information about the mythological creatures with a couple more comprehension questions thrown in for good measure. 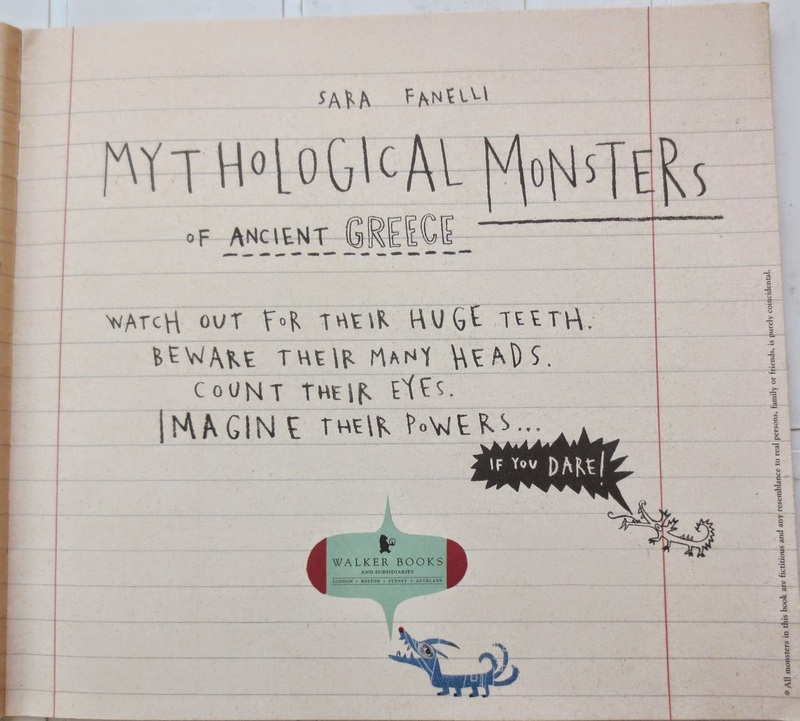 Copyright / dedication page - Sara Fanelli has created a monster, though not from ancient Greece, who wafts the copyright details in his firey breath, and a dog like creature barks out one of the dedications. There's an Italian dedication upside down at the top of the page. Do the children understand it? You may want to tell them that Sara Fanelli is Italian and only came to the UK to make picture books when she was older. Title page - Then there's the title page with similar creatures breathing firey information, daring us to enter the book, or informing us in unFanelli like font that Walker Books and Subsidiaries London . Boston . Sydney . Auckland are the publishers. And all this before we've even started 'reading' the book. That's how important all those other bits of a picturebook are, and why we should never ignore them in our ELT classes. Mythological Monsters is perfect for a children who have had three or four years of English who will enjoy the visual and verbal jokes as well as the topic. It's also an excellent title to use with teacher trainees, as it demonstrates how all the peritextual features can contribute to a narrative. Another of Fanelli's picturebooks which is suitable for use in ELT is My map book. Maybe you've used other titles, if so send in a comment. And if you are interested in Sara Fanelli's work, she has an interesting website.